A staff member at the -next 0rder- booth. December 18th, 2015. The official Digimon Games Twitter updated with several announcements about Digimon World -next 0rder-'s inclusion at Jump Festa 2016, to be held in Japan over December 19th and 20th, in just eight hours. The -next 0rder- booth will feature a giveaway for a limited number of paired jumbo-sized Agumon and Gabumon LCD sprite stickers, using the toilet and meal icons from the original Digital Monster virtual pets. Aoi Eir's new opening theme for the game will be on display at Jump Festa, and the game will have a playable demo on-site. Although several developers have official streams of Jump Festa 2016 configured, Bandai does not seem to be among them. 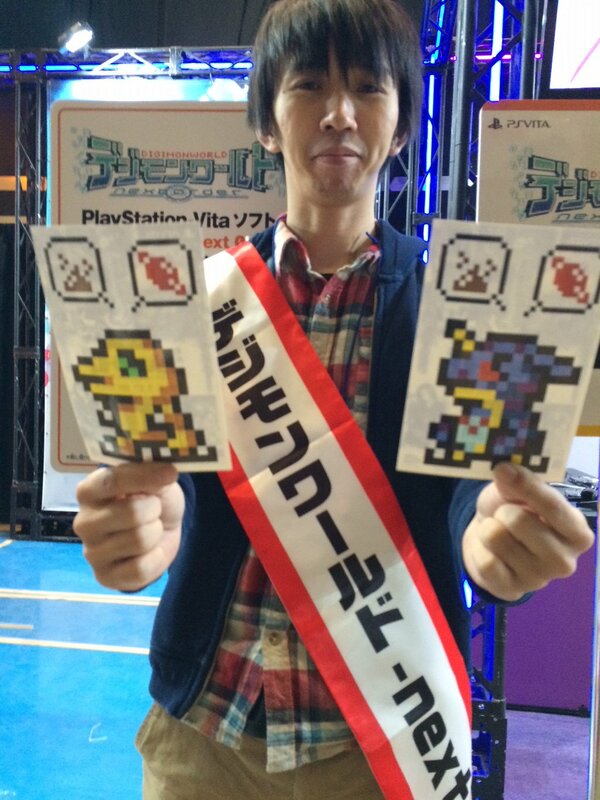 Digimon World -next 0rder- will launch in Japan on March 17th, 2016, on the PlayStation Vita.